Get SWEPT AWAY IN THE SMOKIES this season when you vacation at this fantastic waterfront cabin. 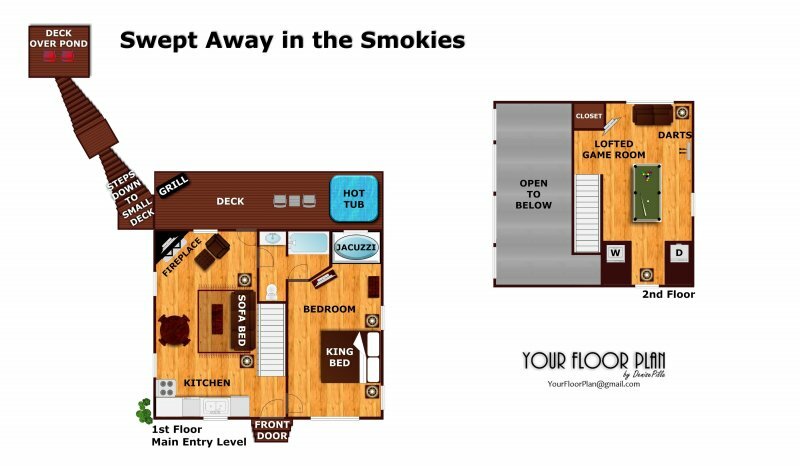 Conveniently located near the front of the Sky Harbor Resort area between Pigeon Forge and Gatlinburg, this beautiful one bedroom cabin for 4, is perfect for your romantic getaway or family vacation. You'll enjoy the sounds of the cascading stream from the steamy hot tub on the full length, private back porch. The stream spills from the scenic fishing pond just behind the cabin. Grab a book and enjoy the view from the sitting deck just over the pond, or bring your fishing pole to chase the big ones! Inside a King master suite with log bed includes in-room Jacuzzi tub and attached bath. Upstairs a game room with pool table, and LED TV keep the fun going, and the vaulted living room with stone/gas fireplace is ideal for snuggling up to your favorite show. No matter your vacation plans, it's easy to get SWEPT AWAY IN THE SMOKIES at this cabin. Call us today!